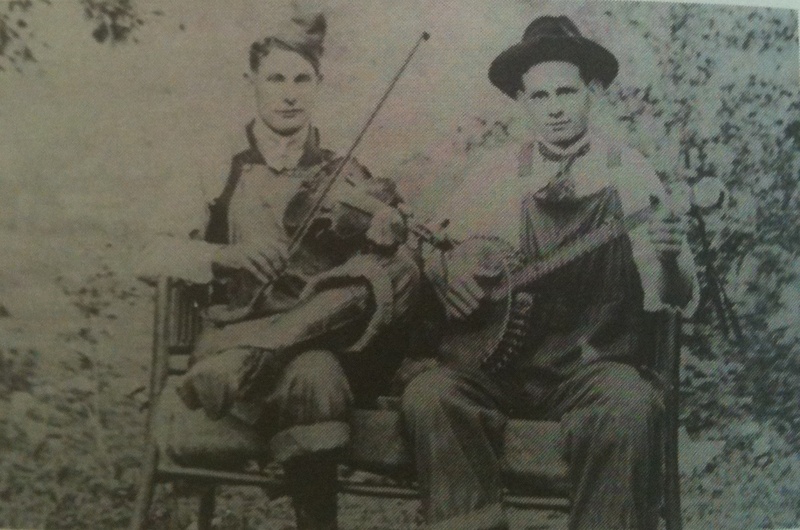 Ward Jarvis, fiddler from Braxton County, WV. We found Bum on our way up the hollow and went to sit on his porch with his aunt, Liza McKenzie, two of his sisters, Alice and Dicy — and of course Shermie. As soon as Liza figured out who we were she looked at Lawrence and said he was just a small boy the last time she’d seen him. “Yeah, I guess around 1940 or ’41 was the last time I come to this area,” Lawrence said. I liked Liza right away. Box of pictures? I thought. Bum knew that Ed was real “easy to get mad about music,” but said he could get him to play nearly anything he wanted because Ed liked him. He’d ask Ed to play something like “John Henry” and he’d say, “Are you sure that’s what you want me to play? You know, I was just thinking about playing that.” If Ed didn’t like someone Bum said he’d “goof around” and not play for them. Things kinda tapered off after that. Nobody knew anything about Ed having any brothers. Cas had heard about Ed’s father, who he thought was named Green. But Lawrence looks like Ed in the face? Back at Iris Williams’, we met another of her brothers, Shelby Kirk. We told Shelby a little of what we’d heard about Milt’s death from Roxie Mullins, who he said had recently died, then listened to his version of the trouble. I asked Shelby where the killing took place and he said it occurred on the Green Shoal side of the river, opposite where Mr. Kirk had showed us. Shelby tried to describe the way law and order worked around Harts in Milt Haley’s day. Mr. Kirk hopped in the car with Lawrence Haley and I and guided us to “Presto’s garden,” a small corn patch located just off of the hill from the Haley-McCoy grave. It was late afternoon: the air was clear and the remains of the sun slanted through the trees on the hillside. Lawrence Haley chose to stay at the garden due to his heart condition, but I made the steep climb toward the grave with Mr. Kirk just behind me. A few minutes later, we stopped at an indentation — a round shallow crater about seven feet in diameter. It had a little pile of stones on each end and was just as Bob Adkins had said it would be. We walked back and forth studying the “bowl” and the markers and I took some pictures. At the bottom of the hill, we got back in the car and rode up Low Gap Road to the site of Milt Haley’s murder. On the way, I told Mr. Kirk what we’d heard about Ed’s mother Emma Jean Mullins being shot in the face. 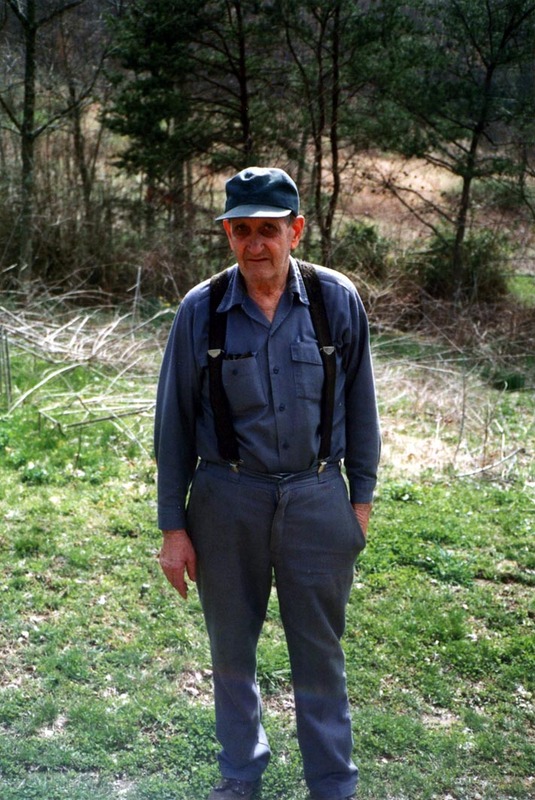 After surveying the site of Milt’s murder, we drove down to the mouth of Harts Creek where Mr. Kirk pointed out the site of the recently burned Al Brumfield house.